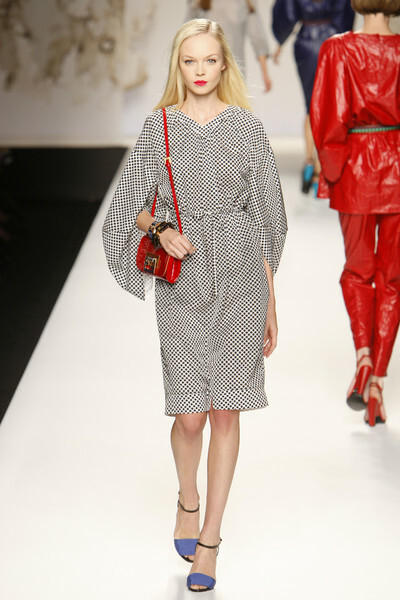 Last season was all about the fifties and sixties and their feminine Mad Men-inspired looks. Now, just one season later, Fashion Week is all about the seventies. It started last week in New York with Marc Jacobs and Anna Sui and this week the seventies were all over the place at Gucci and Fendi. The two Italian fashion houses not only promoted the style from the same period, they also showed their designs in the same color palette, existing of turquoise, orange, purple and blue. Harem pants and tops with puffy sleeves were combined with bright waist belts. 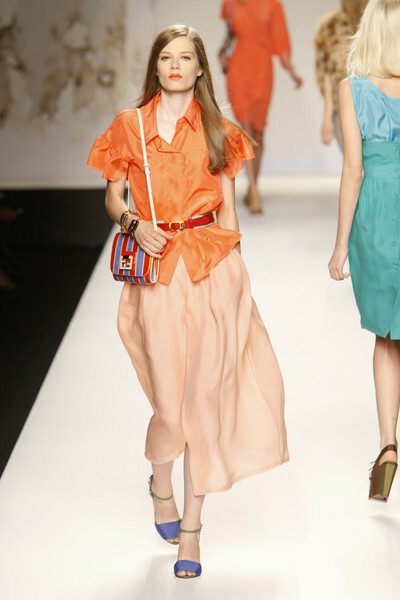 When Karl Lagerfeld added 3-tone belts, shoes and bags the color blocking theme was complete. Still there were some graphic prints too and some of the first outfits were white dresses with a remarkable burning passion cut flame print. Just like we saw at Alberta Ferretti the Fendi show had asymmetrical dresses (with just one sleeve) in it as well. We didn’t necessarily love them immediately, yet by the time it’s summer again we certainly will. Overall the collection looked glamorous and, apart from the high heels, very wearable. We got a feeling fashion is going to be so relaxed next year.